Jeffery Moore was born in Wilmington, Delaware in 1966 and grew up in nearby Newark, Delaware. He has always had in interest in art and has developed his talent over the years through several mediums. Early on, Jeff won several competitions at the regional, state, and national levels for his work in charcoal. Jeff began his carving career while working for William "Bill" Veasey at the age of eighteen. He feels he learned as much about people and life as he did about carving and painting from his years at Veasey Studios. The wide array of artisans employed at the shop and the various backgrounds of the students provided a constant learning experience, including work with several Ducks Unlimited projects consisting of thousands of bird carvings. This led they way to more refined work on gallery pieces, new designs, and eventually, participating competitively. 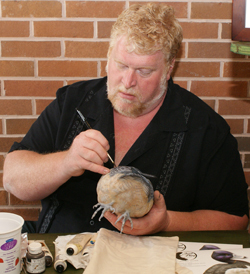 Jeff gained teaching experience by working with Bill in carving and painting seminars. Helping with weekly classes instructed by Debra Narvell and Paul Suarez also provided invaluable information. Teaching truly interested Jeff. Helping someone from start to finish, sparking their interest, and seeing their confidence grow was truly rewarding and most satisfying. Enjoying what one does can be contagious and classes soon grew in size and frequency. Jeff now teaches four weekly classes. "All of our students are working on different projects at different levels, usually on more than one piece at a time". he says. "The variety and intensity of our classes is invigorating and still very enjoyable. I can't claim to many original ideas - most of what I do has been inspired from observing our students, listening to what they have asked for".